SCCF is an expert in the community on growth management issues affecting the Caloosahatchee watershed. Our policy director and researchers from the marine lab routinely review projects for impacts to terrestrial and marine ecosystems. Two parcels of mangrove wetlands straddling Shell Point Blvd are the target for a housing and marina development first proposed in 2012 called Eden Oak Preserve. The development plan targeted 158 acres of wetland and open water to build 252 multi-family units, 54 single-family units, and a 171-slip marina with a clubhouse and community pool. In addition to mangrove habitat destruction and water quality impacts from runoff, the project will impact a number of protected species that live in or utilize the area, including the Florida manatee, Smalltooth sawfish, and the ornate diamondback terrapin. SCCF will be tracking this project through the permit review process currently under consideration by the U.S. Army Corps of Engineers (Corps), South Florida Water Management District, and Lee County. Follow this link for more information and important documents. In 2008, SCCF joined several local and regional nonprofit organizations to challenge the DEP decision allowing the removal of a stormwater structure known as the Ceitus Boat Lift in the westernmost Cape Coral Canal. 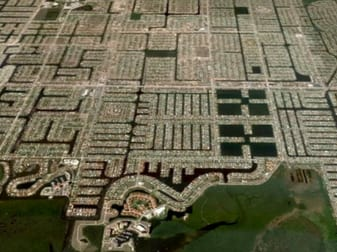 The barrier was required by DEP in 1970s to separate Cape Coral's extensive stormwater canal system from polluting the natural waters of Matlacha Pass Aquatic Preserve. The Barrier is an essential component of a functioning spreader system, the purpose of which is to maintain water levels behind the structure 16" above the downstream levels and direct water west through mangrove wetlands to clean the water and provide critical fish nursery habitat. Without the Barrier, the wetlands have been denied fresh water essential to the fish nursery and Matlacha Pass Aquatic Preserve has now been designated an impaired water body under the Clean Water Act. SCCF and partners are suing to have the Settlement Agreement enforced requiring replacement of the Ceitus Barrier on the North Cape Coral Spreader Canal.